One of the best things about snow is that it makes a busy landscape (or backyard, in this case) look stark and uniform. 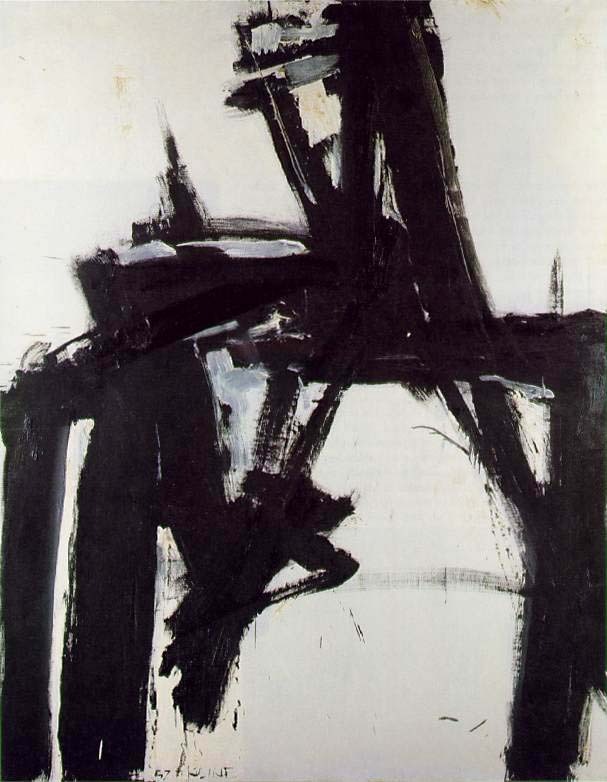 Figures are like swift brushstrokes on a white ground--exactly like the abstract paintings of Franz Kline. 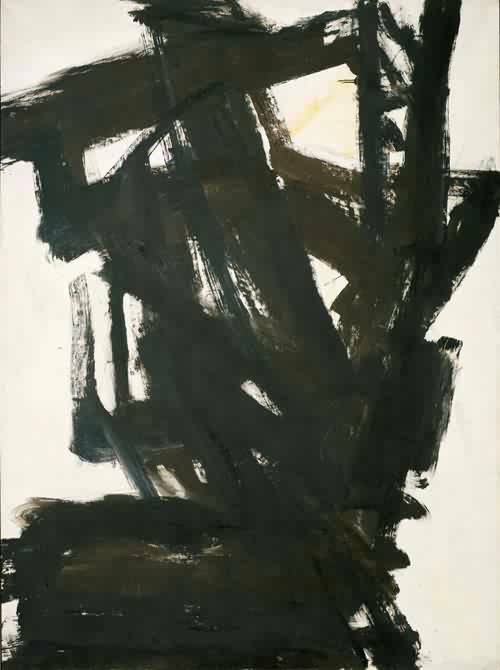 Kline was an Abstract Expressionist active in the New York school during the 1940s and '50s. 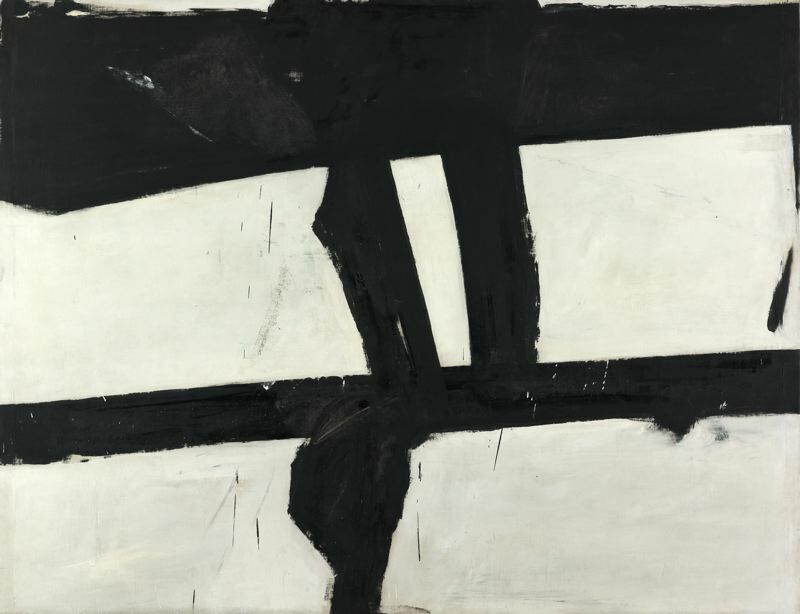 Alongside artists such as Jackson Pollock, Willem deKooning, and Mark Rothko, Kline was a proponent of the action painting movement. His mature works are bold graphic compositions in black and white, which have been compared to Japanese calligraphy (an influence Kline denied). Although his works appear to be visceral and quickly realized, he usually created numerous compositional studies leading up to a large canvas. To him, the positive and negative space were equally important, and some of his works are actually white paint on a black ground. Kline was famously impetuous (like many of the AbEx artists), and his life, in many ways, mirrored the ferocity of his large canvases. I took advantage of the all-white background and struck some Kline-esque poses in the snow, which my Aunt captured from the (relative) warmth of the back doorway. I wore a Tibi coat, Uniqlo jeans, NY & Co. sweater, vintage fur hat, and Sorel "Joan of Arctic" snow boots. Thank goodness for the boots, as the snow nearly reached the top of them! I love the hint of green in these photos, it makes it! I am loving this outfit! Especially that bright pop of colour that you introduced; gorgeous! You look like you are having so much fun in the snow. Wishing you a Happy Year! nice post! very instructive and inspiring:) you sure know how to have fun with all the snow! Brilliant, Ariel! I love the pairings of your snow photographs with the stark Kline paintings. The coat is a perfect choice. Your hat and cowlneck also lovely, the latter adding an element of surprise. Thanks for posting. Stay warm. The green againts the black and white is beautiful. The outfit matches your blog too. Thanks for sharing the photos and drop by me too when you have time. I can totally see how your photographs evoke the feeling of these paintings. Bold brushstrokes of movement against white, indeed! I love how you popped the whole look with that lovely lime green/chartreuse color. It elevates the entire outfit and adds so much interest! these photos are lovely! i like the pop of color in between the black and white! Love the juxtaposition of you and Kline! thanks for the comment! love your style and your blog. hope you can find some vintage clothing you love soon! these photos are perfection! The white snow is the perfect background for your monochromatic-pop outfit. Tress chic! 1) You look strikingly like Blake Lively in these photos! For reals! 2) I was an art history major in college - so your blog is kind of a DREAM for me! The Abstract Expressionists are my favorite group of painters - Pollock and Rothko being my absolute top 2 (I even got engaged at Pollock's studio!) so this post really rocked my world. I'll be back! I love that pop of chartuse green in the black and white outfit. The snow looks so fun. your blog is so fantastic, such a unique perspective and I feel like I'm actually brushing up on my art history too :) i love the pop of color the chartreuse top gives this look! Adding you to my favorites! How fabulous is this winter outfit :D lovee itt! : girl you have proven that one can be warm and fierce at the same time! I gotta step up my winter gamee! Cute outfit! It's crazy to see you in snow, it's the middle of Summer here! What a great snow outfit!! You look so cute in the hat! And I love the pop of color with your sweater! 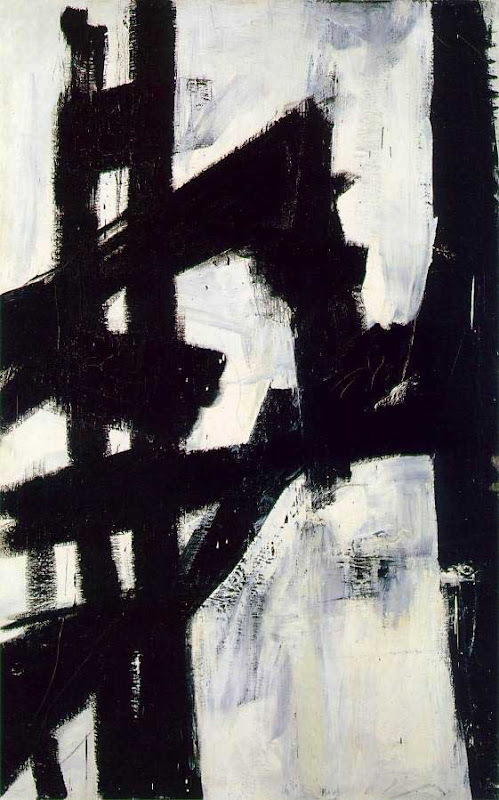 Ah Franz Kline is one of my favorites! I could stare at his paintings for hours. And how fitting that you would style a winter outfit after his works!